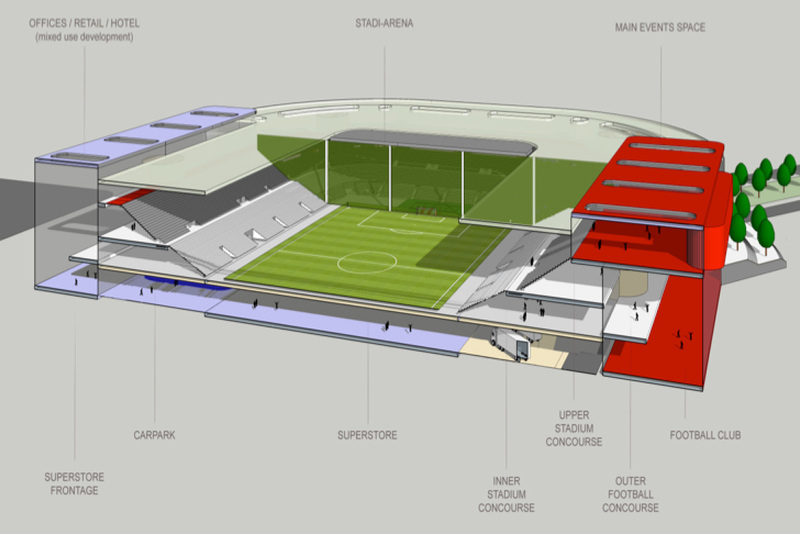 The plans feature a traditional football/rugby pitch with the required facilities for either 30,000 or 50,000 spectators. But there is much more. Within the building there are: car parking for 500 vehicles; a 200 bedroom hotel; extensive retail shops; 30,000 – 40,000 capacity for outdoor rock concert; complete university with many classrooms overlooking the pitch; over 100 bedrooms for student accommodation; offices, 40,000 sq ft exhibition hall, 1,000 seater banqueting suite; indoor arena for: basketball, tennis, netball, table tennis, five-a-side and a Starbucks.